I'll be attending Free Comic Book Day at Acme Comics in Greensboro, NC on Saturday May 2nd (from 10-7 PM) and am now accepting a very limited number of pre-orders for sketches. I will not be doing these sketches at the store, only on pre-order. All sketches will be personalized, no exceptions. If you know you will be attending Acme's FCBD and would like a sketch please drop me a line, my email address in my profile. Additionally, prints of the image above will be for sale at the store on FCBD. Looks fantastic, man! Great job! Hi I'm gonna be helping out for FCBD at Acme,I'm interested in getting a sketch but,I had a bit of trouble with your email. Drop me a line at chrissamnee at aol dot com. This sketch is amazing, Chris! I can't wait to get a hold of one of the prints!! 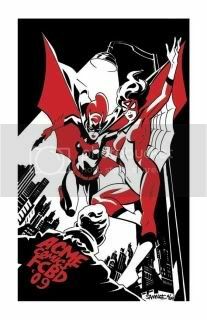 I'm super excited about this years Acme Comics FCBD and so glad you and Laura get to be apart of it!!! Doh! On the other side of the country, but that black, white & red piece is beautiful!